We were the first to develop a 3D world for the Birdly flight simulator. Through Virtual Reality, the user is invited to explore the historic city of Ulm in 1890. At the heart of our experience is the highest steeple of the world – the Ulm Minster. A cathedral 500 years in the making. This experience was honored as a FWA OF THE DAY August, 14th, 2017. Afterwards the guys from FWA asked us to answer a few questions to get more into the project. Have fun! Our aim was to create a unique Virtual Reality Experience for users of all ages and digital expertise, allowing both visitors and inhabitants to experience the ancient city of Ulm from a bird’s perspective. We were keen about being the very first digital agency to explore and create content for such an exciting new device as the Birdly - thus we aimed to create the most realistic flight experience possible. Furthermore, the city of Ulm has been greatly destroyed during World War II. Therefore we put emphasis on a great deal of research to be able to bring the historic city back to life. In order for the flight simulation to feel as authentic and powerful as possible, our focus was on excellent performance as well as a realistic and diverse presentation of the 3D world. 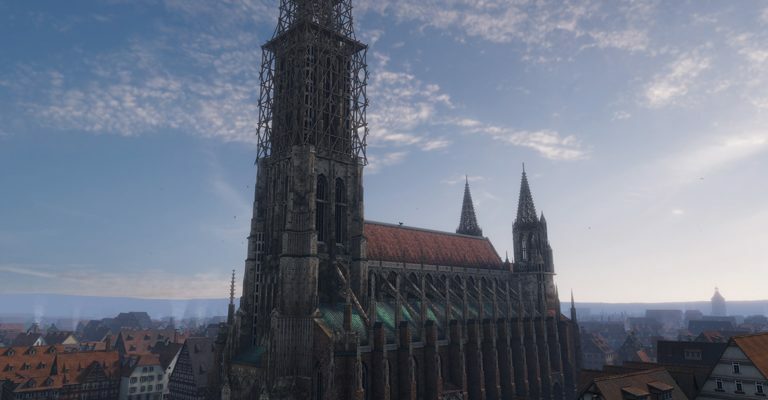 Finding the right balance between the detailed recreation of the Gothic architecture and the level of performance required for a smooth VR-experience was always at the center of our attention. Thus, the main task during optimization was reduction in areas that the user does not visually notice. Also, the lighting of the scene has been quite challenging. In order to visualize the historical city of Ulm as realistic and impactful as possible, we developed tailor-made shaders and produced externally baked lightmaps based on our own concept and art direction. We were really stoked to win yet another FWA of the Day with this project, especially since it has been of such explorative nature. Having your work being presented alongside other great agencies, studios and brands is a great honor and helps your work to receive a great deal of attention and visibility, especially within the international context. We used primarily Blender to create models and also to bake our lightmaps. Photoshop was our main tool for texturing, supplemented by ZBrush and 3D Coat. The experience was assembled and built in the Unity game engine. We further drew on our team’s experience in game design and started with a visual prototype. With this approach we focused on a small section of the city and populated it with several buildings and props brought to completion. This way, we were able to gain insights into the interplay of the achievable level of visual detail and the performance early in the process. The user is moving with a speed of up to 65 km/h. Quite snappy! There are ten animal species living in our ancient Ulm, including three different birds. The most lovingly crafted object in the scene is also one of the smallest – a copper sparrow sculpture perched atop the Minster roof.